Hello Everyone and welcome to my blog! My name is Kate Kelly and I am currently living Dublin in Ireland. 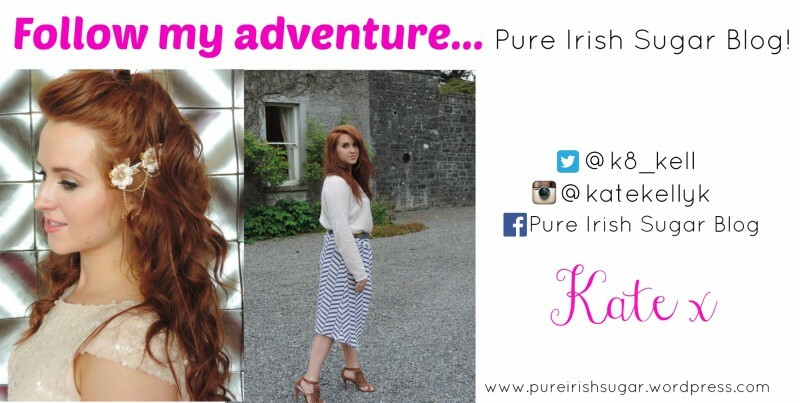 My Blog ‘Pure Irish Sugar’ is about combining my passion of beauty with my love for fashion. My blog is based on ‘The Diary of a Red Head’ living in Ireland with typically Irish red hair, pale skin, blue eyes an the occasional freckle or two. I am a graduate of Marketing and PR, a Makeup Artist and I always need new clothes! I created my blog to show my readers my life living in Dublin and the adventure that awaits… hope you are ready! Hope you all enjoy my blog and happy reading! If you have any suggestions or topics you would wish for me to cover send me an email on katherinekelly56@gmail.com and I would be glad to help out. *Disclaimer* All products are my own unless otherwise stated. I have an I.T.E.C certificate in Make-up Artistry however, I am not calling myself a beauty expert. All views are my own opinion and might not suit everyone. I am inspired by everything around my little world, so it will be clearly stated if I have sought inspiration from elsewhere and give credit where credit is due. I am PR friendly however, I will give my honest opinion and will not review a product ‘for the sake of it’. I don’t like to post overly negative about a product so if I don’t like it I wont be writing about it.